Retired. Age 54. Was O/O for 7 years in the 80's. Starting with May Trucking on May 21th. Starting Sage Technical Services School on April 22. Wow, awesome news again! You're just rolling right along. Definitely looking forward to hearing how you like training on the road. This is when the real truckin begins. Hopefully you'll have a ton of fun. Then comes the big time - solo!!! Yeah. I'm officially hired with May! I go out with the trainer tomorrow for 2-4 weeks. It could be as little as one week, but I want to learn as much as I can. So far I'm very impressed with May. They are BIG on safety. It is built into the culture. The people seem nice. I've talked with my future DM too and he seems on the ball, friendly. Thanks all. Hey that is awesome news!!!! How long is the training period on the road? I made it through the road test (tough! !, twisty narrow roads with frequent RR crossings) and obstacle course( tight, very tight, GOAL many times without being emabrrassed!!) without hitting anything!!!!!!!!!!!!!!!!!! And I will pass the drug test!!!!!!!!!!!!!!!!!!!!! 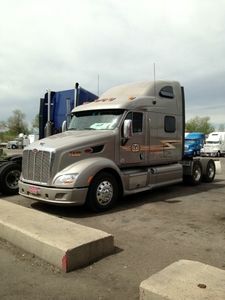 Out on the road with a May Trucking trainer Thursday, finally!!!!!!!!!!!!!!!!!!!!!! Ok to run with no break lights or turn signal on trailer. Brett, you give a great answer, thank you!!!! 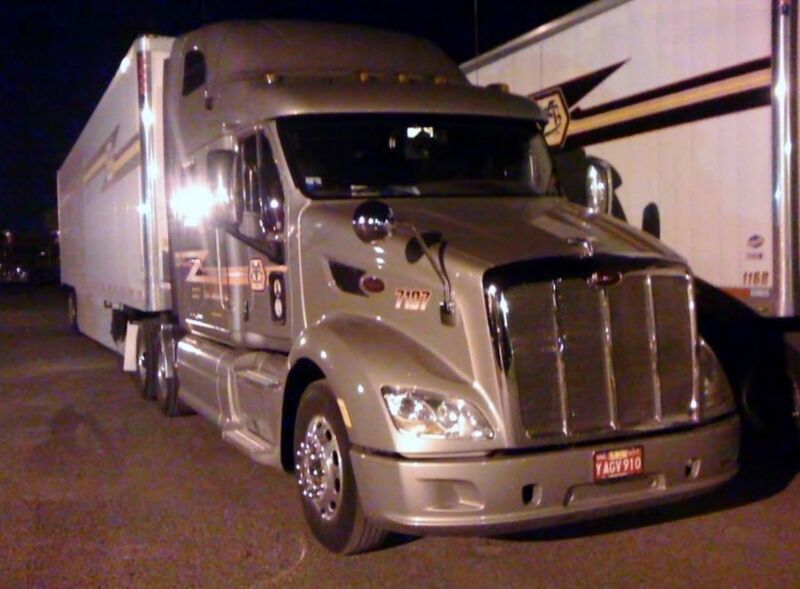 Orientation starts with MAY Trucking!!!!!!!!!!!!!!!!!!!!!!!!!!!!! I will keep you all posted!!!!!!!!!!!!!!!!! Is it my stupidity, or shouldn't the different departments WORK TOGETHER to remedy this situation? Like in dispatch WORKS with safety and visa versa? Why did he have to go over dispatch's head to safety to get this fixed? Doesn't dispatch know the FMSCR's rules and what is allowable and what is not? Or, I know, they are just interested in getting the load delivered on time, and care about nothing else? Thoughts are appreciated. Pray. Seriously. I mean, there isn't a whole lot you can do. Like Crazy Rebel said, get inside somewhere if you have the time, but it's rare that you will. It's really important to watch that weather radar screen and know what's going on around you at all times. I've been able to outrun storms, go around storms, and safely park before getting hit by a storm because I always knew what was out there. But tornados are a lot more tricky because they tend to be part of relatively small weather systems that form quickly. They suddenly pop up with very little warning. Staying aware of the weather around you is the best way to keep yourself out of trouble. Thank you for this from someone that has NEVER ever even been seen one, except on TV. I am worried not knowing what to do, but this helps!!! Holy crap that's a beautiful rig!!! Really nice! Here is daytime pic, thanks to RoadKill!!!! Orientation starts tomorrow, can't wait!!!!!!!!!!!!!!!!!!!!!!!!!!!!!!!!!!!!!!!!!! Pics of my new ride!!!! Posting credit/instructions goes to RoadKill...Thanks Guy!!! 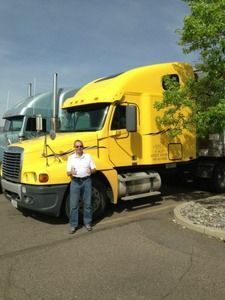 Pic of me, with truck I drove, at school after I completed driving test to get my CDL. Pre-hires mean nothing!!! I got several. I had sent the one that was number one on my list my current MVR at the beginning of the pre-hire process. At the beginning!!!!!!! They had it in their file for me from the beginning!!!! Only AFTER I was 9/10's the way through their FORMAL hire process did they mention something on my MVR that would prevent them from hiring me because of their insurance requirements. And they had my MVR from the beginning!!!!! So I had to scramble and get started the formal hire process with the number two on my list, which has different insurance requirements, and to them, my current MVR was just fine!!!!!!!! So from limited experience, ask any company during the pre-hire phase if ANYTHING on your current MVR could stop you from being hired. Just my two cents worth. Oh that's gonna be awesome. I can't wait to hear what it's like driving that beauty!!! I have two pics of the rig on my computer desktop and I can't figure out how to share them here. 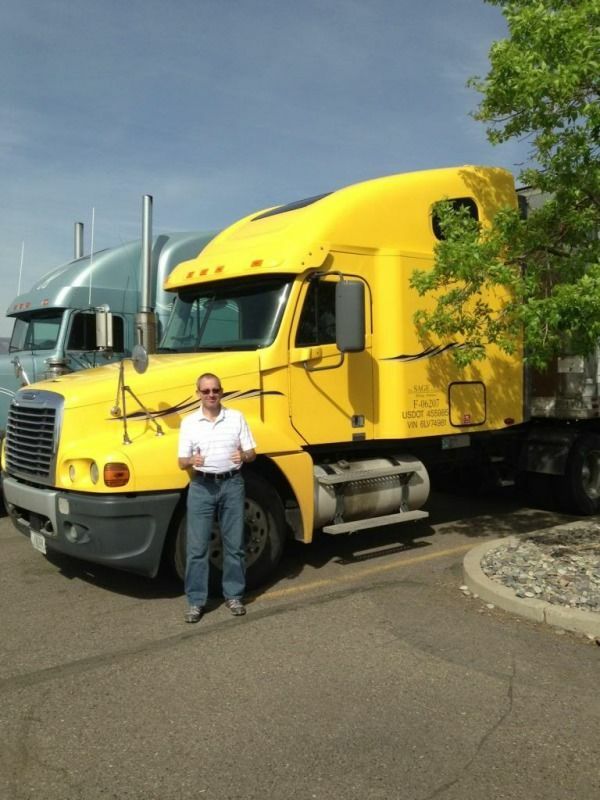 Your HighRoad CDL Training Course had a lot to do with it!!!!!!!!!!!!!!!!! I'm meeting up with my trainer this weekend in DEnver, but I dont officially get on his truck until next Thursday. 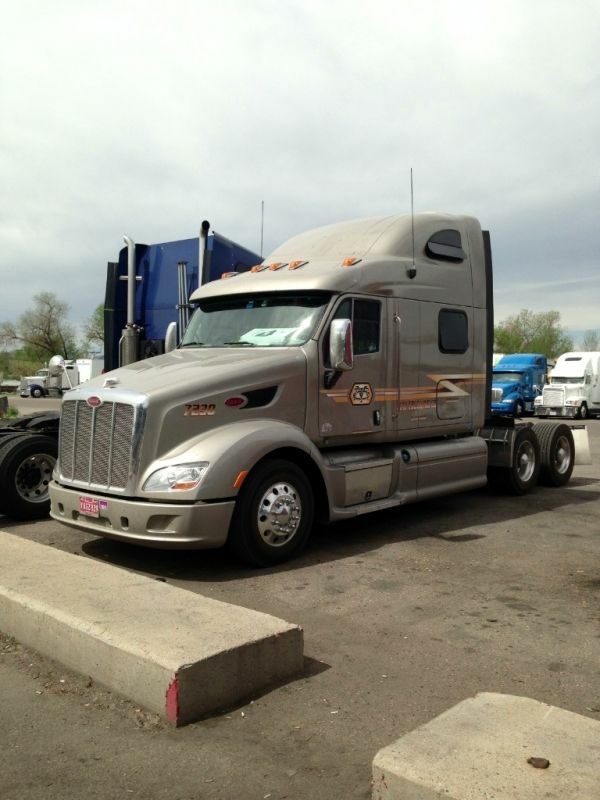 He drives a 2014 Pete 587 fully loaded!!!!!!!!!!!!!!!!!!!!!!!!!!!! I passed my CDL test with flying colors!!!!!!!!!!!!!!!!! Now onto the next phase, orientation and out with the trainer for a minimum of two weeks!!!!! Good deal G Man! I've been considering May also. Keep us updated on how things with them turn out. I am going for 48. I've been talking with a May driver that graduated from my school 8 months ago and he said to go 48, which was my interest anyway. Thanks Brett, YOU and your site have been invaluable!!!!!!!!!!!!!!!!!!! G Man, I'm glad your on your way to enjoy your next adventure....make us proud, and use everything you've learned here. AND you are still gonna keep us posted on how your doing, AND your gonna ask any questions you have...so your set to go. Be sure and pack what you will need, but check out the Packing topic..it will help alot. Yes Ma'am!!!!!!!!!!!!!!!!!!!!!!!!!!!!! Today is final practice, backing (which is no problem) and final drive (which is no problem), Monday 8am MT is test. Which will be no problem!! I am all set on packing thanks to you and this site, so thanks. I have a week before orientation starts in Denver, so I am going to explore the state of Colorado in my car, ending in Denver next Sat or Sun. Any tips or places I should visit?